To say that the latest fad in Vancouver is Neapolitan pizza would be an understatement. Much like Japanese ramen, macarons and diners, there seems to be a new joint opening up every month. The one that started it all was Nicli Antica and it led to a host of others such as Verace, BiBo, Farina, Barbarella, Novo and Via Tevere. 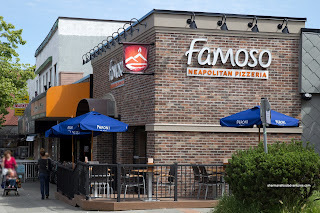 Now we finally get our first "chain" Neapolitan pizza chain called Famoso. 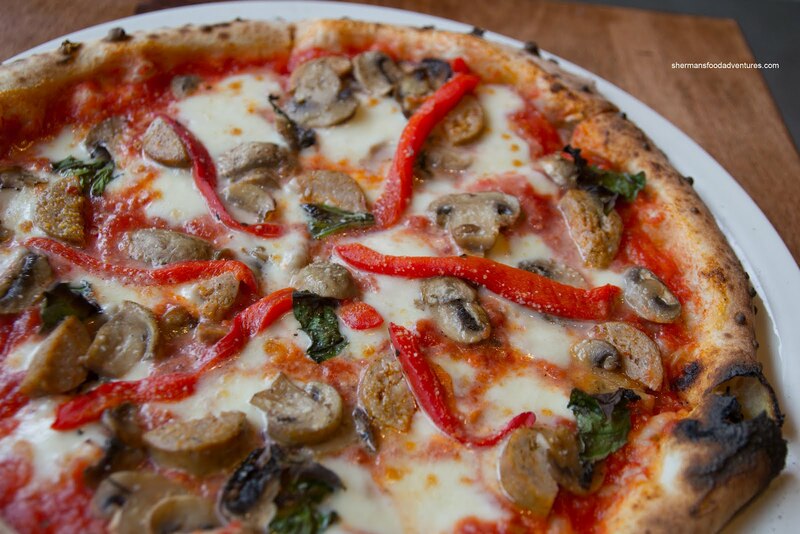 Originating out of Edmonton and now expanding to BC and Ontario, Famoso prides itself on serving authentic Neapolitan pizza. Viv and I were invited to their media preview where we were instructed to order whatever we wanted. Wow. I'm glad Mijune wasn't around because I'm sure she'd try everything on the menu. Channeling my inner-Mijune, I decided to try as much as I could by ordering a bunch of stuff beginning with the Famoso Salad. It was a hearty concoction consisting of romaine lettuce, prosciutto crisps, carrots, cherry tomatoes, spicy sopressata, fire-roasted chicken and feta dressed in a dijon-balsamic vinaigrette. This was more of a meal in itself rather than a starter. 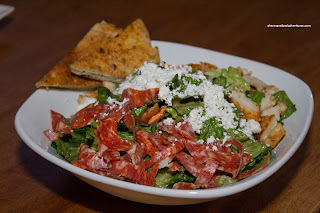 The sopressata provided a nice kick as well as a nice chewy textural contrast to the crisp lettuce. The fire-roasted chicken was flavourful while being not too dry considering it was breast meat. There was a good amount of feta on top to cool the spice from the sopressata. The vinaigrette was mostly on the sweet side and could've benefited from a touch more acidity. Despite that, the salad was good. For our appy, we went for their Prosciutto Wrapped Mozzarella Balls baked in Campania tomato sauce, fresh basil and pecorino romano with flatbread served on the side. Although lacking in texture and shape, the fresh mozzarella balls were nicely seasoned by the salty prosciutto. 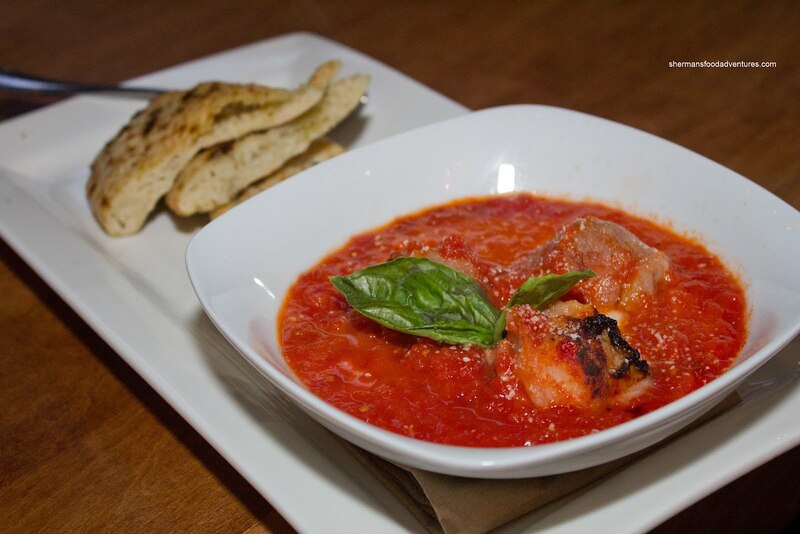 Surprisingly, the best part of the dish was not the balls themselves, rather it was the fresh tomato sauce. One taste and the sauce exuded a brightness from fresh tomatoes. It was naturally flavourful with a desirable tartness which really complimented the mozza balls. Remember how I channeled my inner-Mijune? Well, Viv and I decided to share 4 full-sized pizzas. A daunting task for sure, but hey, the more things we try, the better we'd understand the menu. Of course it was a given to get the Margherita as a baseline of sorts. Okay, sure it is pretty obvious from the picture that the pizza wasn't exactly blistered nor exhibited much in the way of leoparding. I'll cut them some slack because they were pumping out multiple pizzas at a time. Normally, we wouldn't order 4 pizzas and neither would the couple next to us (actually they ordered 7). Hence, it appeared they rushed it a bit. Therefore, the pizza was quite soft in the middle. I'm not sure if this had anything to do with the oven, which was not wood-burning. If we focus solely on the ingredients, they were good. The fresh tomato sauce was very much like the one found in the appy we had. 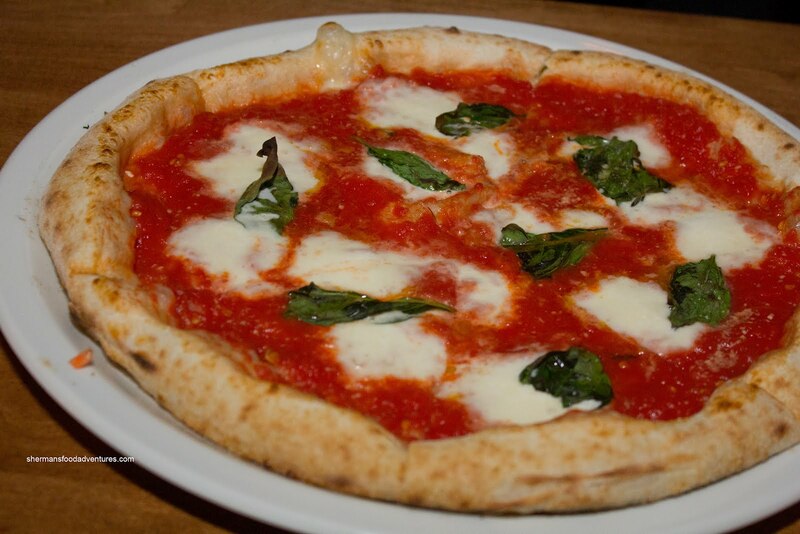 The fresh fior di latte and basil were legit, but with a soggy crust, it was not the complete package. Our second pizza was the Funghi Tartufo with roasted white mushrooms, oyster mushrooms, truffle oil and reggiano parmesan. Rather than a strong mushroom flavour, we got more truffle oil than anything else. This was not a complaint, instead that was more of an observation. 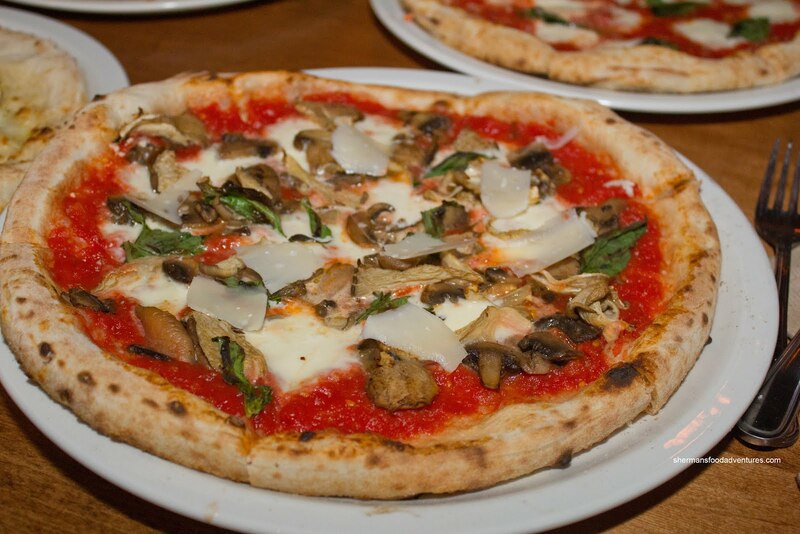 They weren't shy with the mushrooms, which in turn made the middle of the pizza even more soft. This was a good pizza, yet could've benefited from more salt. That was not an issue with the Pollo though. Despite being a chicken pizza, there was plenty of flavour thanks to a nice sprinkle of salt on top. In addition to the chicken, there was roasted red pepper, basil and artichoke hearts. With flavourful fire-roasted chicken (like the one in our salad), sweet peppers and tart artichoke hearts, there was a balance of flavours which didn't miss the tomato sauce. With less wet ingredients, the crust on this pizza was more chewy and crisp on the outside. While we were chatting with the couple next to us, we came to an agreement that we would share any non-duplicated pizzas. 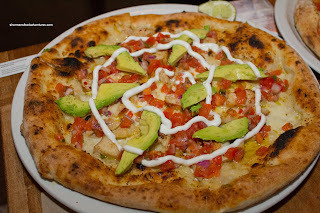 As such, we got to try the San Andreas consisting of EVOO, garlic, and oregano, fresh mozzarella and chili-lime marinated roasted chicken. Once baked, it was further topped with fresh avocado slices, diced roma tomatoes, diced onion, cilantro and drizzled with light cream, served with a lime wedge. Okay, I'm not going to sugar-coat it, this was universally the least-liked pizza. 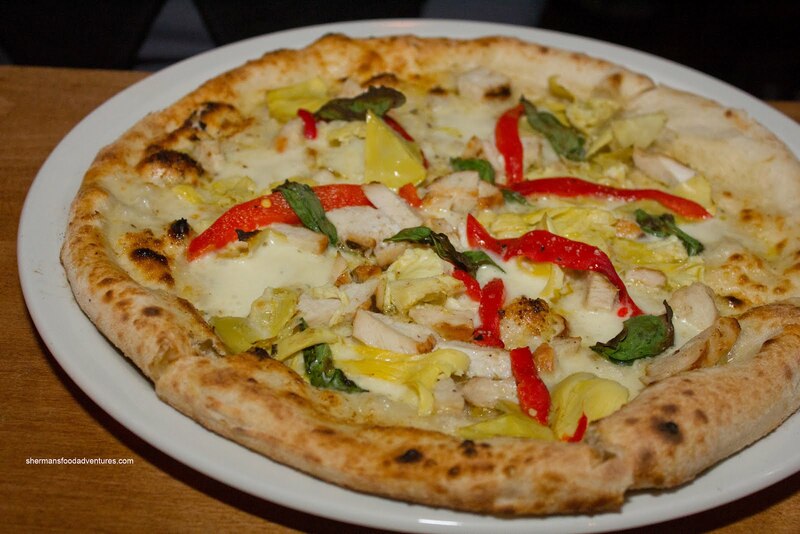 With so many toppings, it only served to make the entire crust even more soggy. It was really too bad since it sounded good and in fact, was good in terms of flavour. We also sampled the Siciliana topped with Italian sausage, Italian ham and baked prosciutto. As an all-meat pizza, I was already liking it. And yes, it was very meaty. However, the flavours seemed muted for some reason or another. It didn't make sense to me since I could see all of the meat, yet couldn't get a tonne of flavour. Now that was not a problem with the Spicy Thai (with mild spicy peanut sauce, fire-roasted chicken, fresh mozzarella, smoked mozza and topped with matchstick carrots, bean sprouts, cilantro and crushed peanuts) though. 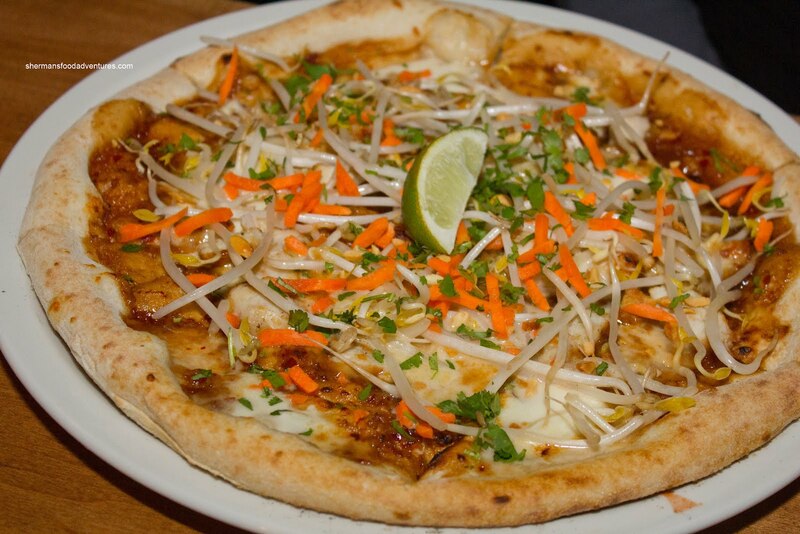 We ordered it with reluctance because Asian fusion on a pizza could be a disaster. Furthermore, anything dubbed as "spicy" on a menu usually means "not spicy enough". This pizza was a complete surprise as it became our favourite one of the night. There was definitely a kick to the pizza which could not be considered wimpy. Yet, it wasn't too spicy that it overwhelmed the other flavours. The crunch from the carrots and sprouts added some texture while the squirt of lime brightened the flavours. By now, we were in a food coma, but hey, there was dessert! We didn't hold back and ordered 4 of them. Yes, that's right. Take that Mijune! 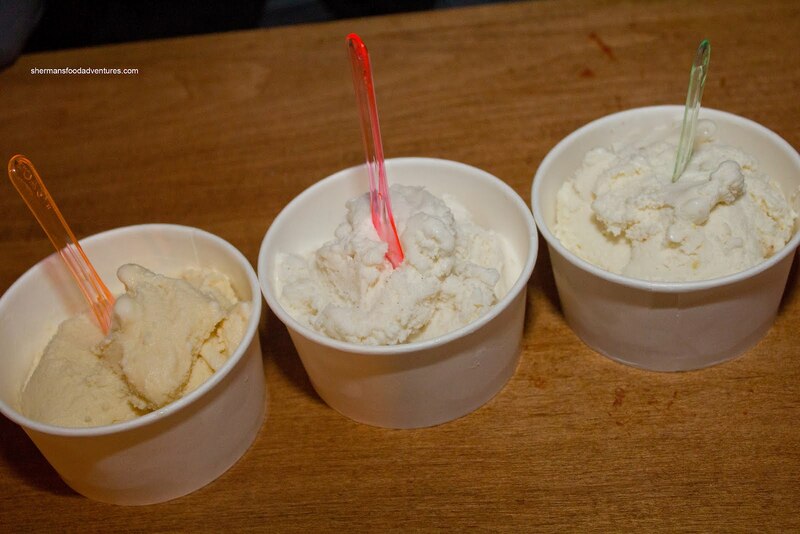 We began with 3 scoops of gelato consisting of Salted Caramel, Vanilla Bean and Key Lime. Since th e gelato was not made on-site, the texture was compromised being a touch icy. The salted caramel had a nice balance of sweetness and salt. In fact, I found it not too sweet which made it easier to eat. The vanilla bean could've benefited from more vanilla beans since the flavours were quite muted. As for the key lime, it definitely tasted like its namesake. I enjoyed it and kept eating it. We also got the classic Tiramisu which was pretty much a textbook version, if not a bit generic. We didn't dislike it nor did we rave about it either. Our only wish was it to be made in-house rather than being pre-made. 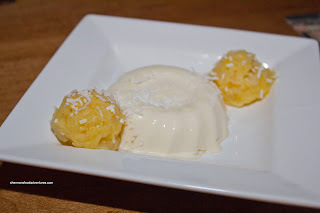 Our second dessert was the Panna Cotta and it was okay. The panna cotta itself was a touch stiff, but was pleasant enough to eat. The side of pineapple was refreshing, yet surprisingly bland. Therefore, the entire dessert was not very memorable. 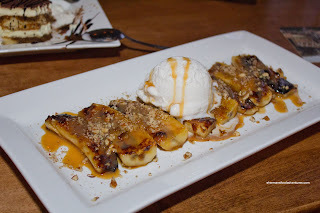 The very last item we had for the night (thank goodness) was the Dolce & Banana. This was the best dessert by far. The caramelized bananas were tasty and sweet. However, we liked how the bananas themselves w ere not overripe which meant that the sweetness was not overbearing. Again, we didn't care for the gelato. Now after our meal was over, I was still troubled by the soggy pizza. With so many Neapolitan-style pizza joints in town, this would be a serious problem. So to make sure, I returned a few months later right when it opened for lunch. Therefore, no rush, no pressure and hopefully no soggy crust. 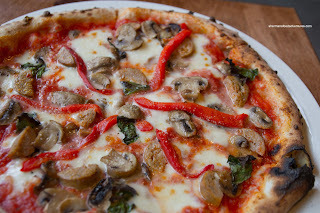 I went for the Conforto with Italian sausage, roasted mushrooms and roasted red peppers. Okay, the good news first. The outside crust was sufficiently charrd with a nuttiness to it. Also, the toppings were tasty and plentiful. The bad news? The rest of the pizza was again soggy. It almost had a crepe-like quality to it. I realize the middle of the pizza is supposed to be softer, yet this was beyond soft. 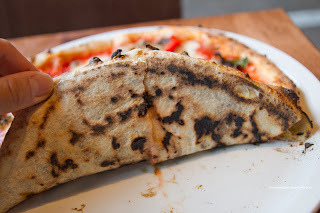 This was really perplexing to me since they have all one needs to make good Neapolitan pizza. Can it be the tomato sauce is too wet? Oven not hot enough? Too many toppings? All of the above? Bottom line - there is a complete Neapolitan pizza to be found somewhere here, it just hasn't happened yet. It is a good thing that, unlike others, you decided to do a revisit (on your own $$$) and check how the restaurant works under "normal" conditions. As for the "sogginess" issue, I can confirm it is no fluke, as I have encountered the same issue when I visited their locations in Edmonton (was accused of killing the sacred cow and that was WAY before expansion plans to Vancouver where in the radar). Probably they intend to do it that way? 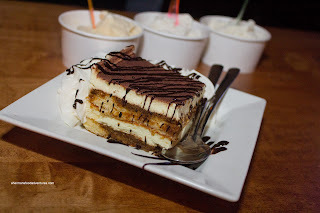 As for the tiramisu, I tried it as well and, similar to you, with all that marketing talk/description in the menu, it didn't really translate into a good product. I know they claim to be a Neapolitan joint...but they are not. Their promo material states that their oven burns at 900C, but one check of the thermostat on the front of the oven clearly indicates that it is running at a far lower 600-650C...not nearly hot enough. (The oven is a gas fired, rotating hearth oven...and if they are aiming to get a AVPN certification...will not pass muster). 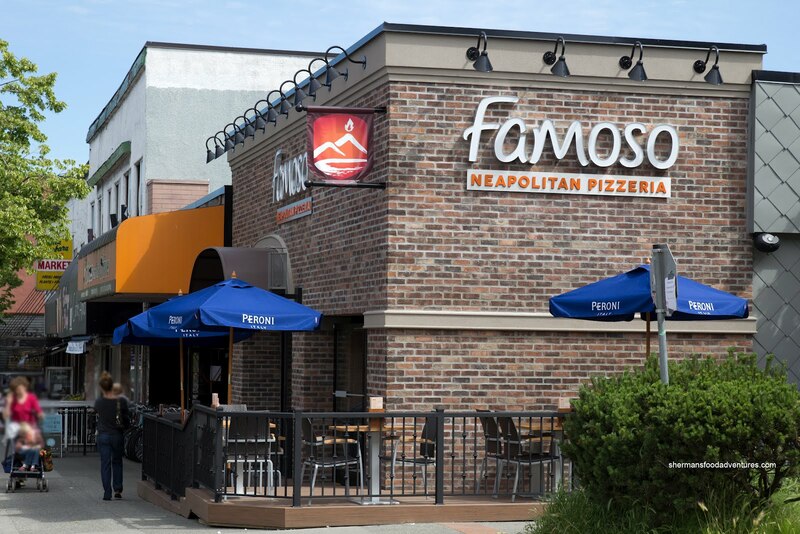 Famoso has been described as the "Earls of Pizza" but Alexandra Gill described it more accurately as the "Starbucks of Pizza". Via Tevere just down the road is a much better place and is truly Neapolitan. @KimHo Yah, somehow the food is passable, but not great. Well, doesn't that describe most chain restaurants? @fmed Yes, I agree, VT and Barbarella are much better choices. Not sure why so many people like Famoso. Maybe they haven't tried the better ones yet? Agreed. 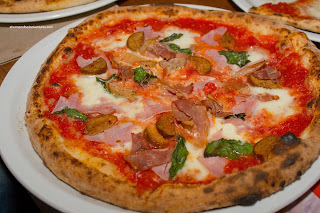 My top picks for pizza (in no particular order) are Via Tevere, Pizzeria Barbarella, Farina. All stylistically different and all pretty good. VT is right in my 'hood so I am there more often than I care to admit.